In March, two years after the launch of the M/Y Magnifica, the CRN shipyard has launched the M/Y Kooilust Mare, prestigious 46 m. yacht, the most recent of a line of yachts in steel and aluminium. The project is by Studio Nuovolari & Lenard, which has designed both the external and internal layout, with the assistance of the engineering department of the shipyard for the technical aspects. The profile of the Kooilust Mare is soft and rounded, while the interiors are distinguished by their distinctive style which expresses itself through a game of strong contrasts, where very different materials co- habitate to offer a continuing alternation between the old and the new. From the cockpit we access the spacious lounge, where there is a sofa area rich in accessories for relaxation. Ahead is the dining area, equipped with a round table to seat 10, constructed especially for this boat. Proceeding to the stem on this same bridge we find a modern professional galley, while in the centre of the boat on the right side, is a lobby with marble flooring in black marquinia with veins of white afyon, giving access to the owner's suite, including a private lounge, toilet, bath and access to a children's room. The spacious bathroom dedicated to the owner is in black marquinia marble and equipped with a Jacuzzi and separate shower. From the central lobby you gain access to the lower bridge for the guests, where spacious windows and a skilful game of mirrors ensure great luminosity to the vip stateroom located at the stern, which is also the full width like that dedicated to the owner. At the centre of the boat are another two guest staterooms with twin beds and private bathrooms while to the right of the stem, is another cabin with double bed and private bathroom. The crew quarters are in the bow are, with cabins with shower and a lounge with L shaped sofa and table. At the stern of the vip stateroom are the engine and control rooms, the latter in an area separated and isolated thermically and acoustically, where it is possible to verify the condition of all the onboard systems. Proceeding towards the stern, we find the garage, which accommodates a tender Novurania Equator XL 600. A second tender, a Novurania 360DL, is positioned towards the bow in an apposite covered place, which is opened electronically. On the upper bridge is the commander's cabin near the radio room and the bridge room. Ahead is the relaxation room, with a home cinema system and access to the fly by a stairway. Always on the upper bridge, in the stern area, is an open-air dining area with a table for 10 people and stern side a sofa with armchairs and coffee table. On the fly bridge there are a Jacuzzi and a round table for dining in total privacy at the shade of the radar arch. Always in this area a bar corner with sofas and food carrying lift, as well as spacious areas for sunbathing. For further information please contact CRN; via E. Mattei 26; 60125 Ancona; tel. 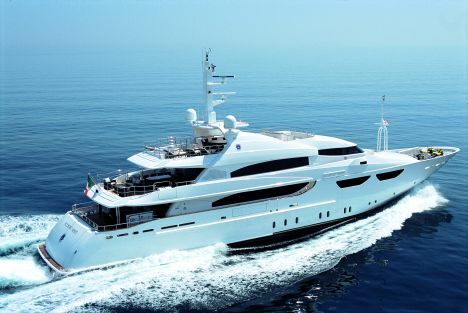 +39 071 5011111; fax +39 071 200008; web site www.crn-yacht.com; e mail info@crn-yacht.com.